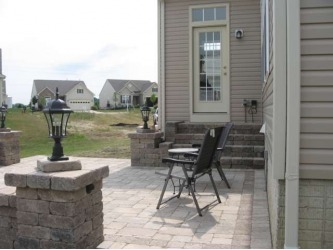 Key Features: Raised Patio, Lighting, Firepit, Stairs. Columbus Paver Patio completed a raised paver patio in Delaware Ohio using Unilock Brussels pavers.The total area of this Delaware patio installation was approximately 300 square feet. The pavers are Unilock Brussels Block Sierra and we added an accent border in Stonehenge Sierra. 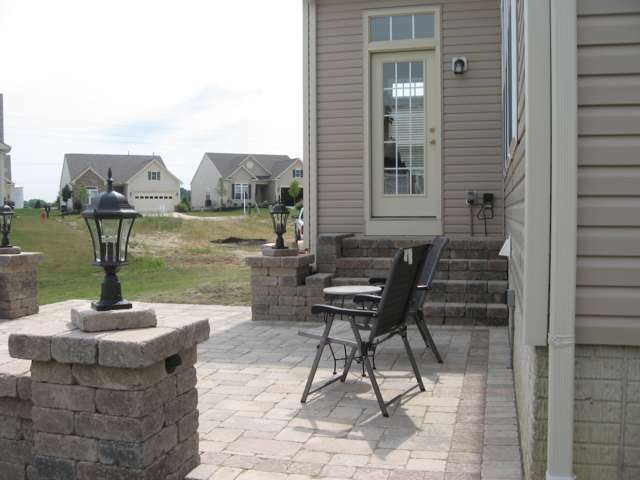 The homeowner originally wanted a deck but was sold on the functionality and low maintenance of concrete interlocking pavers. 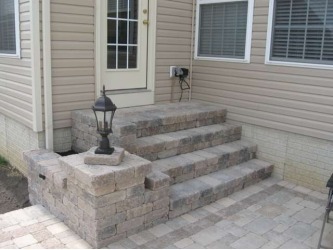 Unilock Dimensional stone was also used to build steps going into the house. 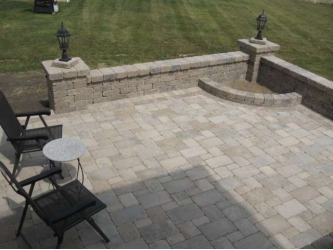 Ohio Paver Patio Landscape Contractors we work in Medina, Akron, Canton, Columbus and most of Northeast Ohio. We install Unilock paver patios, paver driveways, paver walkways, outdoor kitchens, fireplaces, pergolas, waterfalls, ponds, decks and retaining walls. We can also develop a custom landscape design and installation, install landscaping , trees, shrubs and lawn irrigation systems. 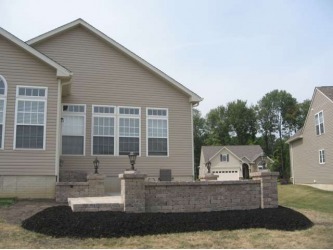 Our Medina, Akron, Canton, Columbus and most of Northeast Ohio clients can be assured our landscaping creations will last for years to come. Remember ......if you are looking for a free quote for landscaping, a paver patio, outdoor fireplace, new lawn, hydroseeding in Medina, Akron, Canton or Columbus Ohio please give Columbus Paver Patios a call for all your landscaping projects.